This genetic genealogy project is aimed at finding out the ancestral relationships between the different Briese families that emigrated to North America, Australia and South America in the 19th and early 20th centuries. The surname "Briese" is of German origin and we know from 19th century emigration records that most Brieses came from the old Prussian provinces of Brandenburg, Pomerania, East and West Prussia, Posen and Silesia. Briese is an “Ortsname” - a place name - of Slavic-German origin (see “Why is the family tree a silver birch? The meaning of the Briese name” for more detail on the origins of the name). Prior to the 13th century few people in northern Europe had family names and when people began to adopt such names in the middle ages, people living in a place called Briese took that on as their family name to identify themselves as coming from that place. This means that people taking on the surname were related by location, but not necessarily by blood. Hence, not all Brieses will be related, though those coming from a similar region in recent times may well be. For example, quite a few emigrant Briese families originated in the Deutsch Krone region of West Prussia. It is precisely to try and unravel this intricate web of relationships that this project has been set up. The test is based on the paternal y-DNA. Hence, any direct male descendant with a Briese surname can participate. Preferably, you will be able to provide the name and origin of your earliest known Briese. We welcome not only participants who are descended from emigrant Briese families, but those who still live in Germany, as this could establish links between emigrant and non-emigrant Brieses. 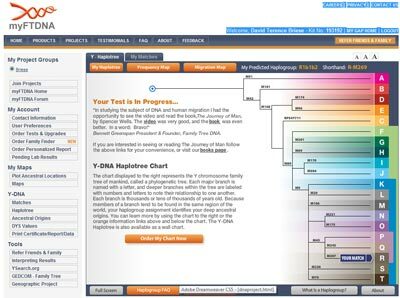 The project is being hosted on the website of FamilyTreeDNA who carry out the testing. You can find out more about the different types of DNA tests and how results can be interpreted. Because the surname follows the male line, the best test for this project is of y-chromosomal DNA. You can also visit the Briese project pages on this site directly and, if you want to become involved, can join up from there by clicking on the “Join Request” tab of this page. If you decide to join the project, please include the name, birth date and location of your most distant paternal ancestor in your profile or provide them to the project administrators. You can order a paternal line (Y-chromosome) DNA test from the Join page or the home page of FamilyTreeDNA. We are recommending a 37 marker y-DNA for best results, though 25-marker test is a bit cheaper and still useful. can discover anyone who has an exact or close genetic match for the markers tested (which generates probabilities of being related). Comparison of these data will help interpret the relationships between the different Briese families. So, if you are a male with the Briese surname or have a male relative or friend who is a Briese, why not join up and help find out where we all fit in the greater Briese family. The project site was created in Dec 2010 and will be updated regularly. For any questions, please contact the administrators, Gail or David.